Division Street is THE hottest neighborhood in Portland! Take a walk with us through this booming neighborhood's creative food & drink scene. We will explore the things that make Division so right now, from an on-trend urban winery, to authentic New Mexican food, Indian street snacks, to a James Beard award-winning bakery, to Portland's favorite sausage & salami makers. You'll love the uniqueness & vibrancy of this neighborhood. As you walk, learn about the area’s art, history and culture from your knowledgeable guide. This food tour is limited to about 12 people, ensuring you enjoy a small-group experience. Go where the locals go! Get out of downtown for a chance to explore the neighborhoods that are truly the heart of they city. You'll meet your guide at the heart of the Division neighborhood, a quick hop away from downtown, to visit some of Portland's most beloved institutions. The group starts with local brews and sausages from the team behind Olympia Provisions, who've been making the city's best charcuterie and sausages since 2009. From there, the tour will continue through the most bustling part of Division to visit Little T Bakery, a James Beard award winner in the category of "Outstanding Baker" for a taste of their baked goods. You'll learn about James Beard (a native Portlander) and why his legacy is so important to Portland's food scene. 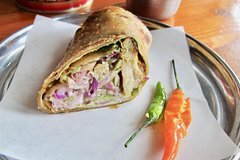 The tour continues to a hidden gem featuring New Mexican cuisine and then on another Portland favorite, Bollywood Theater for unique Indian street food that you aren't likely to have encountered on most Indian menus. We will visit an urban winery and learn all about the urban wine trends and of course, taste wine made at the winery from locally sourced grapes. And finally, the tour wraps up with a slice of seasonal pie, made with an all-butter crust, of course! Make your dinner plans late, this tour will leave you happy and full.